We have been working hard to develop this new creature. Funk drummer brings new possibilities and lot of creativity to a new level. Starting with the sound, because implements tons of amazing samples with Round Robin. Three layers of round robin samples provide the most natural sound never seen in iOS before. With the new effects you can adjust the sound to your personal taste. Reverb, EQ, Delay and Compressor/Gate. The best jam tool improvise like a human drummer, enhanced and adapted to funk drumming. 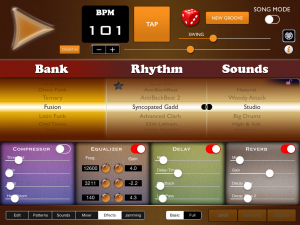 And you can mix-up with other applications with Audiobus, Inter-App or the new Midi Sync by The Spectacular Sync Engine. This entry was posted in Funk Drummer on December 6, 2015 by LumBeat. But I have a problem on my iPhone 4S (iOS 9.2) because isn’t properly display at start. Anyway on my iPad 2 (iOS 9.2) everything is OK. Please fix display issue on iPhone 4S with iOS 9.2. Could you please reply to this comment via email, so I know I am speaking directly to you .. I have a few questions and need support regarding Funk Drummer. Will your apps ever gain MIDI input from external sources? I want to trigger Funk Drummer/AfroLatin via my Roland Octapad but I can’t find any way to trigger the sounds. It sees my Bluetooth MIDI as an input but I don’t seem to be able to get any sounds out. I’ve set the Channel to 10 and I’m using a GM Drum note number setup.